A mission of the European Parliament to take stock of the progress of Albania in fulfilling the criteria for the opening of EU accession negotiations arrived yesterday in Tirana. The mission had been planned months before, and had no relation to the recent political developments, which nonetheless took center stage. After being briefed on the current progress on the five key conditions for the opening of accession negotiations by EU Ambassador Luigi Soreca, the MEPs met with the leaders of the opposition, including PD leader Lulzim Basha and LSI leader Monika Kryemadhi. The EP mission called on the opposition and majority to engage in a dialogue to solve the recent political crisis. They expressed their disappointment with the opposition’s decision to vacate their seats in parliament, and stated that other opposition MP-candidates in party lists could take the seats of those who have resigned. Members of the mission also declared that the current parliament is legitimate, and the buying of votes as revealed by the prosecution wiretaps was an isolated case. They added that the violent images during the protest could influence the decision for the opening of negotiations between Albania and the EU. 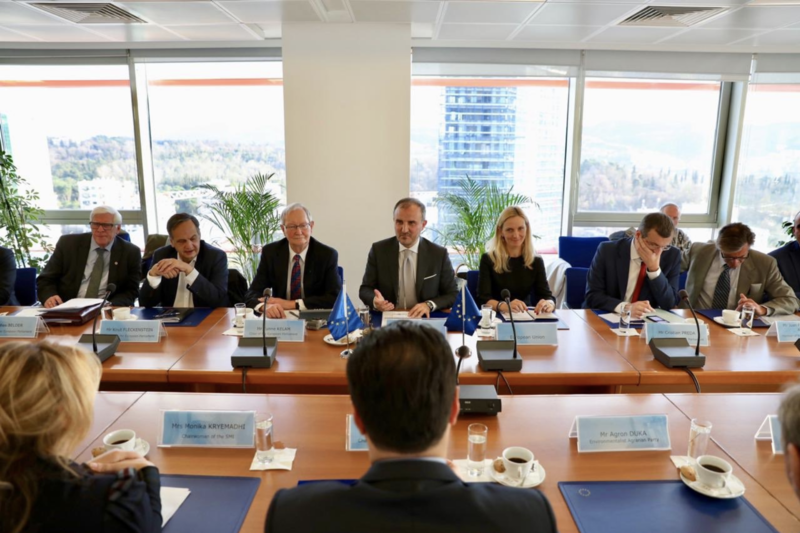 The MEPs then moved on to meet Minister of Interior Sandër Lleshaj to be briefed on the progress on the fight against drug trafficking and organized crime, and Prime Minister Edi Rama. This morning, the EP mission visited Speaker of Parliament Gramoz Ruçi. The EP mission includes MEPs Cristian Preda, Knut Fleckenstein, Juan Fernando Lopez Aguilar, Bas Belder, Ilhan Kyuchyuk, and Tamás Meszerics. Fleckenstein is also special rapporteur for Albania to the EP.